Breast cancer stem-like cells (CSCs) are an important therapeutic target as they are purported to be responsible for tumor initiation, maintenance, metastases, and disease recurrence. Interleukin-8 (IL-8) is upregulated in breast cancer compared with normal breast tissue and is associated with poor prognosis. IL-8 is reported to promote breast cancer progression by increasing cell invasion, angiogenesis, and metastases and is upregulated in HER2-positive cancers. Recently, we and others have established that IL-8 via its cognate receptors, CXCR1 and CXCR2, is also involved in regulating breast CSC activity. Our work demonstrates that in metastatic breast CSCs, CXCR1/2 signals via transactivation of HER2. Given the importance of HER2 in breast cancer and in regulating CSC activity, a pathway driving the activation of these receptors would have important biological and clinical consequences, especially in tumors that express high levels of IL-8 and other CXCR1/2-activating ligands. Here, we review the IL-8 signaling pathway and the role of HER2 in maintaining an IL-8 inflammatory loop and discuss the potential of combining CXCR1/2 inhibitors with other treatments such as HER2-targeted therapy as a novel approach to eliminate CSCs and improve patient survival. The cancer stem cell model of carcinogenesis posits that cancers arise from, and are sustained by, a rare sub-population of cells that possess stem-like characteristics . Akin to normal tissue, cancer tissue is proposed to be organized in a hierarchical manner, which may underpin the cellular heterogeneity of cancers. At the apex lies the tumor-initiating or cancer stem-like cell (CSC), so called because these cells share key stem cell properties of their normal tissue counterparts . CSCs have the capacity to self-renew and differentiate, but the mechanisms that strictly regulate these processes under normal conditions are deregulated, leading to their expansion and production of aberrantly differentiated progeny . CSCs are defined functionally by their capacity to initiate a human tumor in immunocompromised mice and to self-renew, giving rise to a new tumor when passaged into another mouse, and their ability to differentiate into non-self-renewing cells which constitute the bulk of the tumor . Breast cancer was the first solid tumor in which CSCs were identified . By sorting cells derived from metastatic pleural effusions, Al-Hajj and colleagues demonstrated that cells expressing high levels of CD44 but low or absent CD24 and lineage markers (CD44+/CD24−/low/Lin−) were highly enriched for tumor-forming capacity in non-obese diabetic/severe combined immunodeficient mice. Other cell surface markers such as CD133 and CD49f and intracellular cytokeratin 5 and ALDH1 (aldehyde dehydrogenase)/ ALDEFLUOR have subsequently been used to enrich for or identify human breast CSCs [5–8]. This subpopulation of cells is also characterized by their capacity to survive in anchorage-independent conditions and be cultivated in vitro as mammospheres [9, 10]. There is evidence that breast CSCs are relatively resistant to chemo-, radio-, and endocrine therapies [6, 11, 12]. By evading the effects of these treatments, CSCs can survive to repopulate the tumor, leading to disease recurrence. Hence, to halt disease progression, there is a need to develop novel CSC-targeted therapies. Multiple intrinsic factors - such as drug efflux, more efficient DNA repair mechanisms, masking of receptors, quiescence, inactivation of phosphatase and tensin homolog (PTEN), and overexpression of HER2 - are reported to confer resistance of breast CSCs to conventional therapies. Accumulating evidence indicates that extrinsic factors and other cells that form part of the tumor microenvironment and CSC niche are also responsible for regulating and promoting CSC activity. The association between inflammation and cancer is well established, and deregulated expression of multiple inflammatory cytokines, including interleukin-8 (IL-8), in malignant breast disease has been recognized for more than 15 years. Although there is substantial evidence that IL-8 is increased in breast cancer, the mechanisms by which IL-8 contributes to breast cancer progression have remained virtually unknown. However, recent studies indicate that IL-8 can promote CSC invasion, metastases, and treatment resistance. Targeting CXCR1/2 signaling has proven efficacious in in vivo models of breast cancer as well as primary invasive and metastatic breast cancers, catalyzing the initiation of clinical trials evaluating CXCR1/2 inhibitors. Here, we review the key components of the IL-8 signaling pathway, evidence implicating IL-8 in breast cancer, regulation of CSC activity via CXCR1/2, and the role of HER2 in maintaining an IL-8 inflammatory loop and discuss the potential of combining CXCR1/2 inhibitors with other treatments to improve outcomes in breast cancer. IL-8, also known as C-X-C motif ligand (CXCL) 8 (CXCL8), is a small soluble protein and belongs to the CXC chemokine family, which is one of four chemokine families . The CXC family is characterized by a single amino acid, named 'X', between the first two cysteines and is derived from a gene cluster mapped to chromosome 4 between q12 and q21 . IL-8 was originally identified as a potent neutrophil activator and chemotactic factor secreted by activated monocytes and macrophages [15–17]. Many other cell types - including fibroblasts , lymphocytes , neutrophils , endothelial cells , and a variety of normal and malignant epithelial cells [22–27] - have since been shown to secrete IL-8. IL-8 is pro-angiogenic and this property is conferred by a Glu-Leu-Arg motif that precedes the first N-terminal cysteine residue [28, 29]. The biological effects of IL-8 are mediated via two class A, rhodopsin-like guanine-protein-coupled receptors (GPCRs): CXCR1 (IL-8RA) and CXCR2 (IL-8RB) [30, 31].The genes encoding CXCR1 and CXCR2 are located in close proximity to each other on chromosome 2 (2q34-35) . The CXCR1 gene consists of two exons separated by an intron , whereas CXCR2 consists of three exons separated by two introns . The receptors share 77% amino acid homology and retain common structural motifs, raising the possibility that they may have derived from gene duplication [31, 35]. Like other GPCRs, CXCR1 and CXCR2 are characterized by 7-transmembrane-spanning regions, an extra-cellular N-terminus, and an intracellular C-terminus . CXCR1 is activated by IL-8 and granulocyte chemotactic protein-2 (GCP-2)/CXCL6 . CXCR2 is more promiscuous as it can be activated not only by IL-8 but by many other CXC chemokines such as growth-regulated oncogene (GRO)-α/CXCL1, GRO-β/CXCL2, GRO-γ/CXCL3, CXCL5, GCP-2, and neutrophil-activating protein-2 (NAP-2)/CXCL7 . Studies in phospholipid bilayers indicate that the cell membrane is important in mediating IL-8 binding to the N-terminal residues of CXCR1 . Ligand receptor interactions are complex and exactly how these interactions mediate ligand-binding affinity and receptor activation remains largely unknown . However, studies demonstrate that signaling requires interaction between the N-terminal region of IL-8 and the N-terminal extracellular domain of the receptors [40, 41]. As with other GPCRs, CXCR1 and CXCR2 are characterized by their association with heterotrimeric G proteins, which consist of α, β, and γ subunits . Ligand binding catalyzes the exchange of guanosine diphosphate for guanosine triphosphate on the Gα subunit, which triggers the release of this subunit from the receptor and the Gβγ subunits . The Gα and Gβγ subunits subsequently activate a variety of signaling pathways that can have different effects depending on the cell type. The three principal pathways are phosphatidylinositol 3' kinase/Akt (PI3K/Akt), phospholipase C/ protein kinase C (PLC/PKC), and Ras/Raf/extracellular signal-regulated protein kinases 1 and 2 (Erk1/2) [44–46]. Other signaling pathways include focal adhesion kinase, Rho, Rac, and janus kinase/signal transducers and activators of transcription (JAK/STAT) [47–49]. IL-8 is upregulated in a wide variety of solid cancers, such as prostate, gastric, bladder, ovarian, lung, and melanoma, and is reported to contribute to multiple hallmarks of cancer, such as increased proliferation, angiogenesis, invasion, and metastases [25, 26, 50–53]. IL-8 is overexpressed in breast cancer compared with normal breast tissue, and although there is substantial evidence that IL-8 may promote breast cancer initiation and progression via the above mechanisms, more recent evidence indicates that this cytokine is a key regulator of CSC activity. Novel therapeutics aimed at inhibiting CXCR1/2 signaling may halt disease progression in tumors driven by IL-8 and other CXCR1/2 ligands. Breast cancer cells are reported to express CXCR1/2  and secrete IL-8 [27, 55], and rare genetic polymorphisms of CXCR2 and IL-8 are associated with an increased risk of developing large, high-grade, lymph node-positive breast cancers [56, 57]. Regulation of IL-8 within the tumor microenvironment is complex, not only because of the variety of cells that can secrete it but also because of the multitude of factors that can affect IL-8 expression by these different cell types (Figure 1). Other cytokines such as IL-1β, tumor necrosis factor-alpha, and IL-6; growth factors such as epidermal growth factor; and hormones such as estrogen and progesterone are all reported to upregulate IL-8 expression in breast cancer cells [58–60]. Recent co-culture studies indicate that activation of fibroblasts growth factor receptor in mammary tumor cells induces upregulation of IL-8 and other CXCR1/2 ligands by macrophages through decreased activity of the transforming growth factor-beta/Smad3 pathway, resulting in increased tumor cell migration and invasion . Cross-talk between breast cancer cells and mesenchymal cells, which form an integral part of the tumor stroma, can also induce secretion of several CXCR1/2 ligands, including IL-8, CXCL1/GRO-α, CXCL6/GCP-2, and CXCL7/NAP-2 . Model of cytokine networks depicting the proposed interactions between breast cancer cells and stromal cells. (a) Interleukin-8 (IL-8) is secreted by cancer cells, mesenchymal cells, and macrophages via multiple signaling pathways. (b) IL-8 promotes breast cancer stem-like cell (CSC) activity via CXCR1/2 by activating EGFR/HER2-dependent and -independent signaling pathways. Red circles denote CXCR1/2 ligands: IL-8/CXCL8, CXCL1/GRO-α, CXCL5, CXCL6/GCP-2, and CXCL7/NAP-2. bFGF, basic fibroblast growth factor; CXCL, C-X-C motif ligand; EGFR, epidermal growth factor receptor; FGFR, fibroblast growth factor receptor; GCP-2, granulocyte chemotactic protein-2; GRO, growth-regulated oncogene; HER2, human growth factor receptor 2; IGF-1R, insulin-like growth factor 1 receptor; JAK/STAT, Janus kinase/signal transducers and activators of transcription; NAP-2, neutrophil-activating protein-2; Src, sarcoma kinase; TGF-β, transforming growth factor-beta. In order for cells to metastasize, they must invade surrounding structures. Several studies have demonstrated a positive correlation between ectopic IL-8 expression and the invasive potential of breast cancer cells. In breast cancer cell lines, invasion is directly proportional to IL-8 expression, and overexpression or treatment with recombinant IL-8 promotes invasion [27, 63]. Conversely, short-interfering RNA knockdown of IL-8 in breast cancer cell lines with relatively high constitutive expression, such as MDA-MB 231, inhibits invasion . Further evidence implicating IL-8 in the metastatic process comes from in vivo studies. Using an in vivo selection method to generate cells with a high or low metastatic phenotype from the parental MDA-MB 231 cell line, Bendre and colleagues  (2002) demonstrated significant upregulation of IL-8 and invasion in the highly metastatic cells compared with the poorly metastatic cells. Furthermore, IL-8 expression in cells cultured from experimental lung metastases is substantially greater than in cells cultured from primary tumors . Consistent with these findings, clinical studies report significantly higher IL-8 levels at metastatic sites compared with primary sites . More recent studies demonstrate that knockdown of CXCR2 or inhibition of CXCR1/2 activity decreases spontaneous metastases in vivo [67, 68]. Together, these studies demonstrate that IL-8 and other CXCR1/2 ligands are important in facilitating metastatic colonization in breast cancer. Chemo-resistance resulting in incurable disease remains a significant problem in managing patients with breast cancer, especially in the metastatic setting, in which cure is not achievable. Several mechanisms - such as drug efflux via breast cancer resistance proteins, more efficient DNA repair mechanisms, masking of receptors, and inactivation of PTEN - have been implicated in conferring this phenotype. Accumulating evidence indicates that increased activity of CXCR1/2 via ligand upregulation may serve as an adaptive response to protect cancer cells from the cytotoxic effect of conventional chemotherapy agents, thereby limiting their clinical efficacy. Certainly, patients with metastatic disease treated with multiple cycles of chemotherapy have elevated serum IL-8 levels compared with those with localized cancers . Moreover, serum IL-8 level is an independent prognostic factor for post-relapse survival in patients with metastatic breast cancer . In vitro upregulation of IL-8 and other CXCR1/2 ligands by breast cancer cells is observed in response to conventional chemotherapy, and multidrug-resistant breast cancer cell lines produce significantly higher IL-8 protein levels compared with non-resistant controls [71, 72]. Furthermore, failure of novel targeted therapies, such as PI3K/mammalian target of rapamycin (mTOR) inhibitors, has been attributed to upregulation of IL-8 via alternative signaling pathways involving JAK2/STAT5 . Pharmacological inhibition or genetic knockdown of IL-8, however, has been shown to sensitize breast cancer cells to the cytotoxic effects of conventional chemotherapy agents . Importantly, in human breast cancer xenograft models, CXCR1 inhibition is reported to add to the efficacy of docetaxel, resulting in greater inhibition of tumor growth and reduction in systemic metastases . Given these promising results, combining CXCR1/2 inhibitors with standard chemotherapy agents and emerging targeted therapies, which may directly or indirectly increase IL-8 as part of the adaptive response, could help to overcome treatment resistance, resulting in improved outcomes. The failure of current therapies to eradicate breast cancer is hypothesized to be due to the existence of a subpopulation of cells that can evade the effects of these treatments. Substantial evidence indicates that breast CSCs are intrinsically resistant to chemo-, radio-, and endocrine therapies and, as such, can survive to repopulate the tumor, resulting in disease recurrence. It is becoming evident that, in addition to intrinsic resistance mechanisms, complex cytokine networks within the tumor microenvironment can rescue and promote CSC activity while more differentiated cells within the tumor succumb to the effects of conventional therapies. Recent studies indicate that CXCR1/2 signaling forms an important defense mechanism in regulating breast CSC activity. CXCR1 is overexpressed in the CSC subpopulation compared with bulk tumor cells, and ligand activation promotes their invasive capacity [68, 73]. More recent studies indicate that IL-8 can promote a state of 'stemness' by inducing epithelial-mesenchymal transition , a process that is implicated in regulating invasion and metastasis and in the acquisition of stem cell characteristics [75–77]. Activation of CXCR1/2 in breast cancer cell lines with recombinant IL-8 is reported to expand the pool of CSCs and increase self-renewal [62, 73]. We recently validated these findings by using a different panel of breast cancer cell lines and, importantly, found the same effect on self-renewal in primary samples isolated both from invasive breast tumors and from metastatic cells from ascites and pleural effusions . Interestingly, we demonstrated a significant direct correlation between metastatic fluid IL-8 level and mammosphere formation when cells from such fluid were cultured ex vivo, suggesting that cancers with higher IL-8 levels have greater CSC activity . Recent in vivo studies report that bone marrow-derived mesenchymal stem cells (MSCs) are recruited to sites of developing tumors, co-localize with breast CSCs within the CSC niche, and are responsible for accelerating tumor growth by increasing the population of breast CSCs through cytokine networks . Mechanistically, Liu and colleagues  propose that these effects are initiated by cancer cell-derived IL-6 and sustained by IL-8 and other CXCR1/2 ligands, namely CXCL6/GCP-2 and CXCL7/ NAP-2, released from both the cancer cells and mesenchymal cells. Furthermore, cancer cell-derived IL-1 can induce expression of IL-8 and CXCL1/GRO-α by MSCs, thereby contributing to the formation and maintenance of CSCs . A recent study reports coordinated regulation of IL-8 with IL-6 and CXCL1/GRO-α in triple-negative breast cancers (TNBCs) which may contribute to the poor prognosis of this subgroup . In that study, Hartman and colleagues demonstrated that stimulation of TNBC cells with lysophosphatidic acid (LPA), an inducer of inflammatory signaling, resulted in coordinated secretion of IL-8, IL-6, and CXCL1/GRO-α via an EZH2/nuclear factor κ-light-chain-enhancer of activated B cells (NFκB)-dependent pathway. These effects were abrogated by pharmacological or genetic inhibition of the LPA receptor, EZH2 (a critical regulator of NFκB-induced inflammatory gene expression), or direct inhibition of NFκB . Inhibition of CXCR1/2 signaling by using repertaxin, a non-competitive inhibitor, is reported to decrease the proportion and activity of CSCs in vitro, as measured by a decrease in the fraction of ALDEFLUOR-positive cells and mammosphere formation, respectively . In vivo, treatment of mouse xenografts with repertaxin decreased tumor growth and increased the efficacy of docetaxel. This was associated with a reduction in the tumor-initiating and self-renewal properties of the remaining CSCs as demonstrated by a reduction of tumor formation following re-implantation of cells into recipient mice . More recently, Hartman and colleagues  (2013) reported similar effects on anchorage-independent colony formation in TNBC cells by using short-hairpin RNA (shRNA) to knock down IL-8 and CXCR1. More-over, concurrent inhibition of IL-8 and IL-6 had a synergistic effect on reducing colony formation and tumor initiation in vivo as well as increasing apoptosis and sensitizing cells to paclitaxel . Together, the above studies demonstrate that the CXCR1/2 signaling axis forms an integral component of a complex inflammatory cytokine response which is critical in maintaining breast CSC activity via autocrine or paracrine routes or both. Up to 25% of breast cancers overexpress HER2, conferring a higher rate of recurrence and mortality . Studies suggest that HER2 overexpression promotes tumor formation and metastasis by increasing the proportion of CSCs and their self-renewal and invasive properties [82, 83]. More recently, it has been proposed that HER2 may promote breast cancer initiation and progression by activating multiple pro-inflammatory cytokine feedback loops. Overexpression of HER2 is reported to increase IL-6 expression, generating an autocrine-positive feedback loop via STAT3/Akt/NFκB signaling pathways, resulting in enhanced breast CSC activity and HER2 treatment resistance [60, 84]. 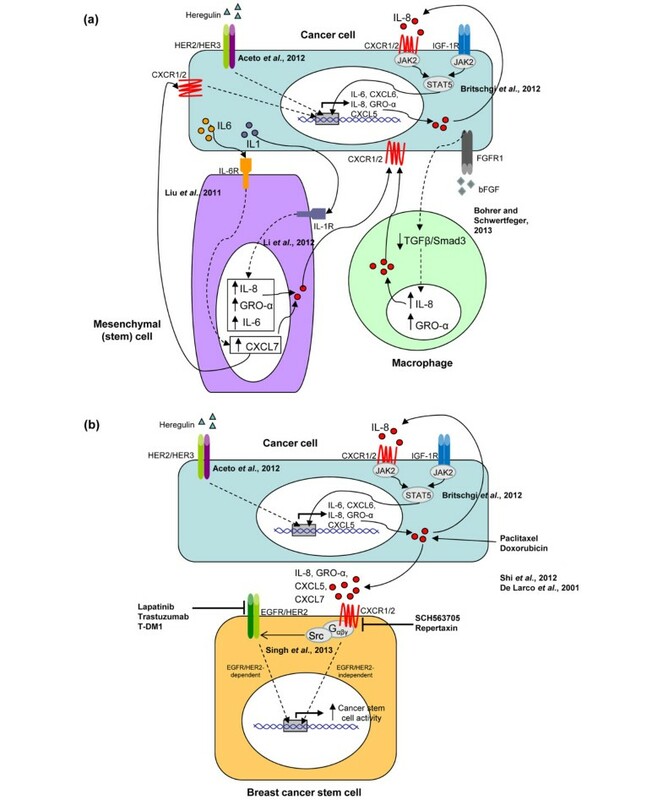 Accumulating evidence indicates that HER2 modulates IL-8, and in light of recent findings discussed below, we propose that HER2 forms an integral component of an IL-8-dependent positive feedback loop leading to increased breast CSC activity. Mechanistically, this may contribute to the poor prognosis of HER2-enriched tumors. Overexpression of HER2 in breast cancer cell lines is reported to induce a 'cytokine signature' characterized by upregulation of IL-8 and other CXCR1/2 agonists such as CXCL1/GRO-α [85, 86]. This effect is potentiated by co-expression of HER2 and HER3 via increased autoactivation of HER2 . Conversely, inhibition of HER2 activity by using pharmacological inhibitors or genetic knockdown reduces IL-8 expression in HER2-over-expressing breast cancer cell lines through inhibition of the PI3K-Akt signaling pathway [85, 86]. In vivo, inhibition of tumor growth with trastuzumab is associated with downregulation of IL-8 in HER2-positive xenografts . The correlation between HER2 overexpression and increased IL-8 is supported by clinical evidence. A series of early small studies reported higher serum IL-8 levels in patients with metastatic HER2-positive disease compared with HER2-negative disease and higher IL-8 protein level in HER2-positive cancers compared with HER2-negative cancers [86, 88]. These findings have recently been corroborated by using bioinformatic analysis of 1,881 primary breast cancer samples derived from multiple large datasets . Using gene set analysis, Aceto and colleagues reported significantly higher levels of IL-8 transcripts in tumors displaying a HER2-enriched phenotype compared with normal-like and luminal subtypes. We recently reported fresh insights into HER2 signaling in breast cancer by demonstrating transactivation of HER2 upon ligand activation of CXCR1/2 . We found that transactivation of HER2 via CXCR1/2 is Srcdependent and leads to the activation of AKT and ERK1/2 signaling pathways, which are known to be critical in regulating breast CSC activity [78, 89]. Inhibition of HER2 activity with lapatinib, a dual epidermal growth factor receptor (EGFR)/HER2 tyrosine kinase inhibitor, abrogated the mammosphere-promoting effect of IL-8 in both HER2-positive and -negative primary breast cancers. These findings demonstrate that the functional effects of CXCR1/2 activation are dependent, at least in part, on HER2. Importantly, in HER2-positive cancers, CXCR1/2 inhibition was found to add to the efficacy of HER2 inhibition . Given the importance of HER2 in regulating CSC activity, activation of this pathway could have important biological consequences especially in tumors expressing high levels of CXCR1/2 ligands. There is evidence that IL-8 shows an inverse association with estrogen receptor (ER) expression, with ER-negative breast cancers expressing higher levels of IL-8 compared with ER-positive cancers [27, 88]. In light of recent evidence implicating IL-8 in driving disease progression, it is possible that elevated levels of IL-8 are responsible for selectively driving disease progression in ER-negative/ triple-negative tumors compared with ER-positive tumors; however, this remains to be determined. Together, the above studies support the existence of an IL-8-positive feedback loop, as summarized in Figure 1. Once activated, this can initiate a self-perpetuating cycle leading to continuous stimulation of breast CSC activity and thereby hastening disease progression. Production of IL-8 by cancer cells, mesenchymal cells, and macrophages promotes breast CSC activity via CXCR1/2 by activating EGFR/HER2-dependent and -independent signaling pathways. Direct activation or auto-activation of HER2 can increase IL-8 expression which can further activate CXCR1/2 signaling via a paracrine or autocrine route or both. Other cytokine feedback loops, such as IL-6, could potentially feed into the above cycle by upregulating IL-8 production via NFκB signaling . Transcriptional activation of IL-8 is controlled primarily by NFκB; however, other transcription factors such as activating protein-1 and CAAT/enhancer-binding proteins can also regulate IL-8 expression and act synergistically with NFκB to augment gene expression [90, 91]. NFκB is also responsible for regulating expression of IL-6, although more recent evidence indicates that this transcription factor is involved in regulating the coordinated expression of IL-6 and IL-8 in TNBCs. Mechanistically, this may be responsible for conferring the synergistic effect of these cytokines in regulating breast CSC activity and contribute to the poor prognosis of this subtype . Thus, dual inhibition of IL-6 and IL-8 or inhibition of NFκB may be required to derive therapeutic benefit in tumors in which cytokine expression is coordinated. Increasing evidence indicates that IL-8 is a key extrinsic regulator of breast CSC activity. This may contribute to the poorer prognosis of tumors that express high levels of IL-8 or other CXCR1/2 ligands and contribute to treatment resistance. Consequently, targeting CXCR1/2 signaling may abrogate disease progression in a subset of breast cancers. Pharmacologically, this can be approached by interfering with either ligand activation or receptor function. Antibodies against IL-8 have demonstrated anti-tumor effects in xenograft models of bladder cancer  and melanoma . Trials in patients with chronic inflammatory diseases associated with increased production of IL-8, such as palmoplantar pustulosis, report that monoclonal humanized antibodies to IL-8 are clinically effective and well tolerated . Although IL-8 is the most well-studied CXCR1/2 ligand in breast cancer, targeting IL-8 alone may be of limited benefit since other CXCR1/2 agonists - such as CXCL1/GRO-α, CXCL2/ GRO-β CXCL3/GRO-γ, and CXCL5 - are co-regulated with IL-8 . This problem can be circumvented by inhibiting CXCR1/2. Various orally active small-molecule non-competitive antagonists of CXCR1 and CXCR2 - such as repertaxin (Dompé, Milan, Italy), SCH479833 (Merck, Whitehouse Station, NJ, USA), and SCH527123 (Merck) - have demonstrated anti-tumor effects in xenograft models of breast cancer , colorectal cancer , and melanoma , including the inhibition of spontaneous colon cancer liver metastasis . SCH563705 (Merck) has demonstrated particularly high binding affinities to CXCR1 and CXCR2 and has proven effective at inhibiting primary human breast CSC activity . Owing to the pleiotropic effects of IL-8, caution must be exercised when trialling CXCR1/2 inhibitors as they could have unexpected toxicities. In addition to promoting tumorigenesis by increasing angiogenesis and invasion, IL-8 is reported to exert anti-tumor effects through neutrophil recruitment . Neutrophils and other cells such as cytotoxic T cells, T helper cells, and natural killer cells form part of the immune surveillance system which operates to detect and eradicate cancer cells . Hence, CXCR1/2 inhibitors could inadvertently promote tumor growth by blocking the anti-tumor effects of neutrophil infiltration. Novel technologies aimed at delivering drugs specifically to the cancer cells could help minimize these effects. Similarly, CXCR1/2 inhibitors have been shown to reduce circulating neutrophil counts with the potential for synergistic myelo-toxicity when combined with chemotherapeutic agents . Although the above CXCR1/2 inhibitors have shown efficacy in preclinical studies, they are still in the early stages of drug development. Repertaxin, originally developed to prevent IL-8-induced reperfusion injury, is the only CXCR1/2 inhibitor that has undergone clinical testing . Phase I trials demonstrate that repertaxin  and SCH527123  are well tolerated in healthy volunteers and patients with severe asthma, respectively. Based on recent evidence that CXCR1/2 inhibition can inhibit breast CSC self-renewal and metastases in vivo , clinical trials are under way to determine the safety and efficacy of repertaxin in combination with docetaxel chemotherapy in patients with advanced breast cancer [102–104]. Ultimately, combining CXCR1/2 inhibitors with existing chemotherapy and endocrine therapy agents or HER2-targeted therapies (or both) may be more effective at eliminating both the CSC and non-CSC populations, leading to improved outcomes in both the adjuvant and advanced settings.